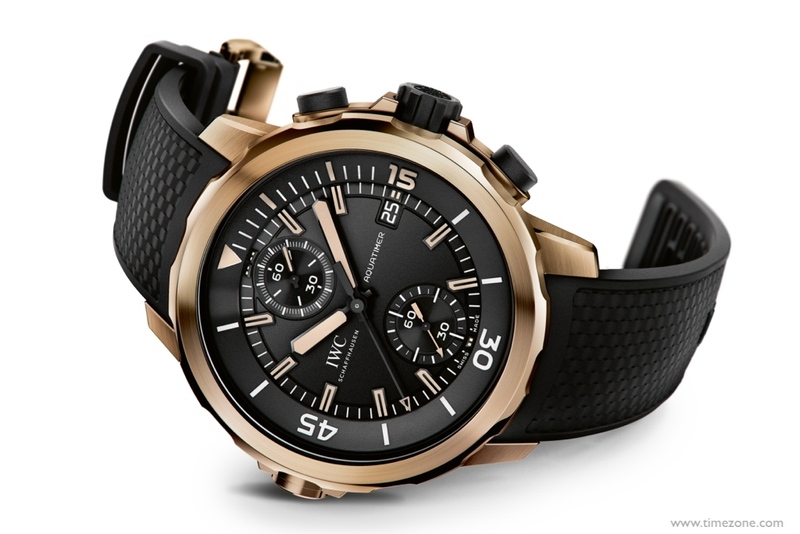 For 2014, IWC relaunches its Aquatimer Collection with six new models. Photographs of three models are presented, below. The most conspicuous technical modification in the new Aquatimer generation is the innovative external/internal rotating bezel complete with IWC SafeDive system. The mechanism combines the advantages of an internal rotating bezel, which engages precisely in steps of one minute and protects the mechanism against dirt and seawater, with the ease of use of an external rotating bezel that can be moved simply by a diver wearing gloves or with cold fingers. A sliding clutch system connects the two rings by the rotation of the external bezel being transmitted to the inside of the case and the internal bezel. For safety reasons, the internal bezel only moves anticlockwise. This ensures that, even if a diver were to move the bezel accidentally, zero hour, the time at which he can return safely to the surface without the need for decompression stops would not be exceeded. The Super-LumiNova coating for the dive time scale on the internal bezel guarantees excellent legibility at all times, no matter how poor the visibility. The two colours, which glow in the dark, are also an aid to orientation on the dial: green for displays relevant to dive time, blue for the hour display. For the first time ever, the Aquatimer Perpetual Calendar Digital Date-Month (Ref. 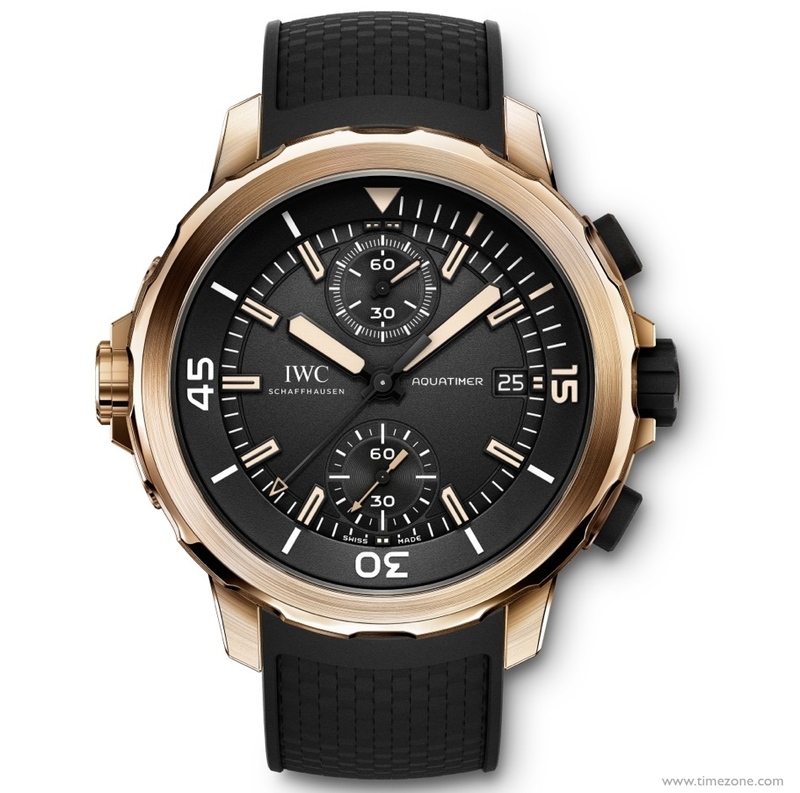 IW379401) is IWC's first diver's watch equipped with a perpetual calendar. The Aquatimer Perpetual Calendar Digital Date-Month is a genuinely big watch from two points of view. On the one hand, there is the IWC-manufactured 89801 calibre with perpetual calendar and large digital display for the date and month, a feature very much in the Pallweber tradition of 1884. On the other, the limited edition flagship of the new collection comes with an impressive case diameter of 49 millimetres. This makes the Aquatimer Perpetual Calendar Digital Date-Month the second-largest wristwatch in IWC's history, after the Big Pilot's Watch of 1940. Limited to just 50 editions. 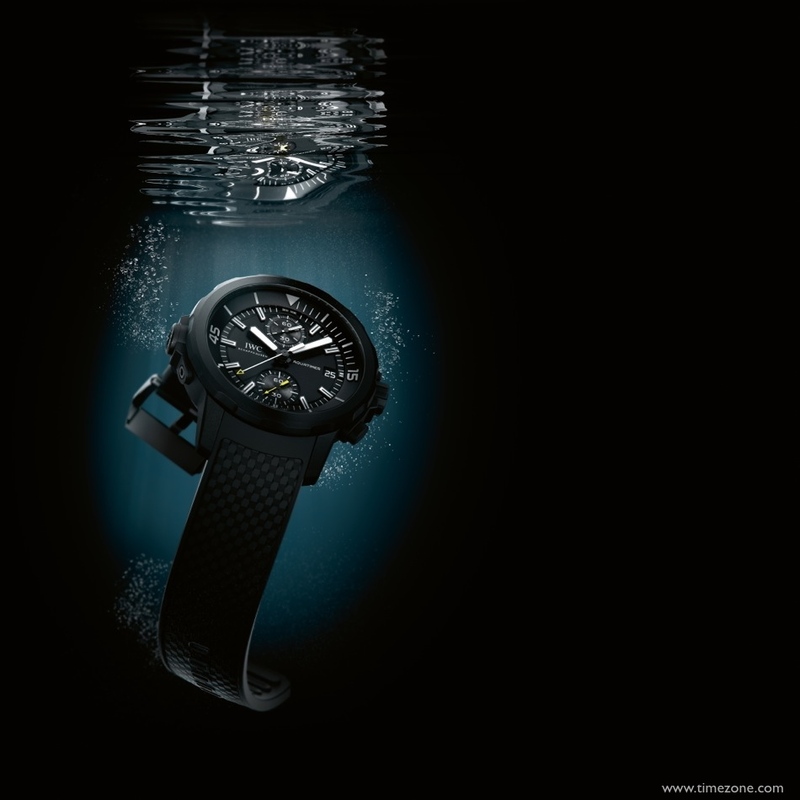 Following in the footsteps of the GST Deep One of 1999 and the Aquatimer Deep Two of 2009, the Aquatimer Deep Three in titanium (Ref. 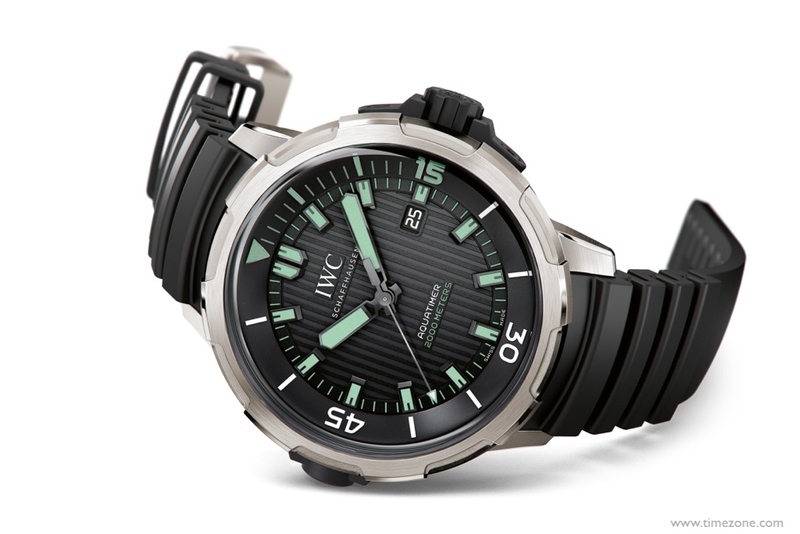 IW355701) is the third generation of IWC's diver's watches to feature a mechanical depth gauge. Both the depth gauge and the rotating bezel system have been continuously developed and improved. During a dive, the blue depth indicator moves to show current dive depth, while the red maximum depth indicator remains at the maximum depth attained, down to a maximum of 50 metres. The Aquatimer Deep Three thus provides a complete backup system to a dive computer. The Aquatimer Automatic 2000 (Ref. 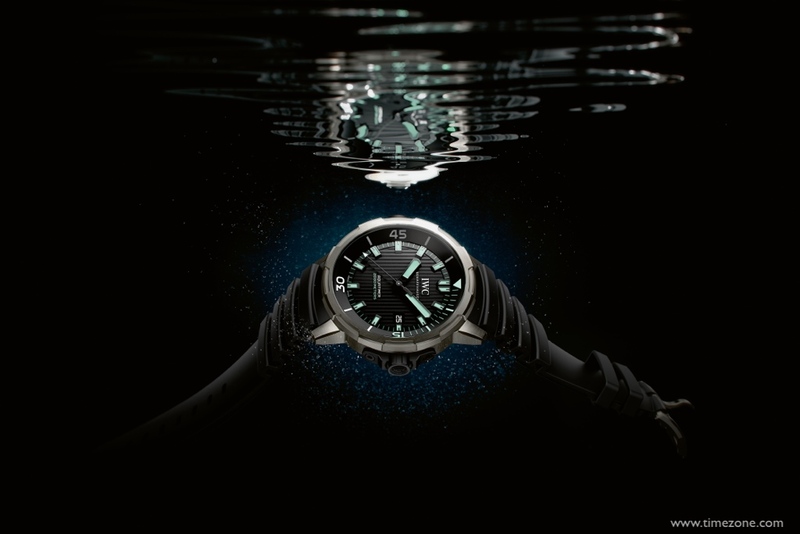 IW358002), water-resistant to 200 bar, continues IWC's tradition of manufacturing timepieces that can withstand extraordinarily high pressures for both amateur and professional divers. Its titanium case and minimalist design are reminiscent of another iconic IWC model: the Ocean 2000, created by Ferdinand A. Porsche in 1982. 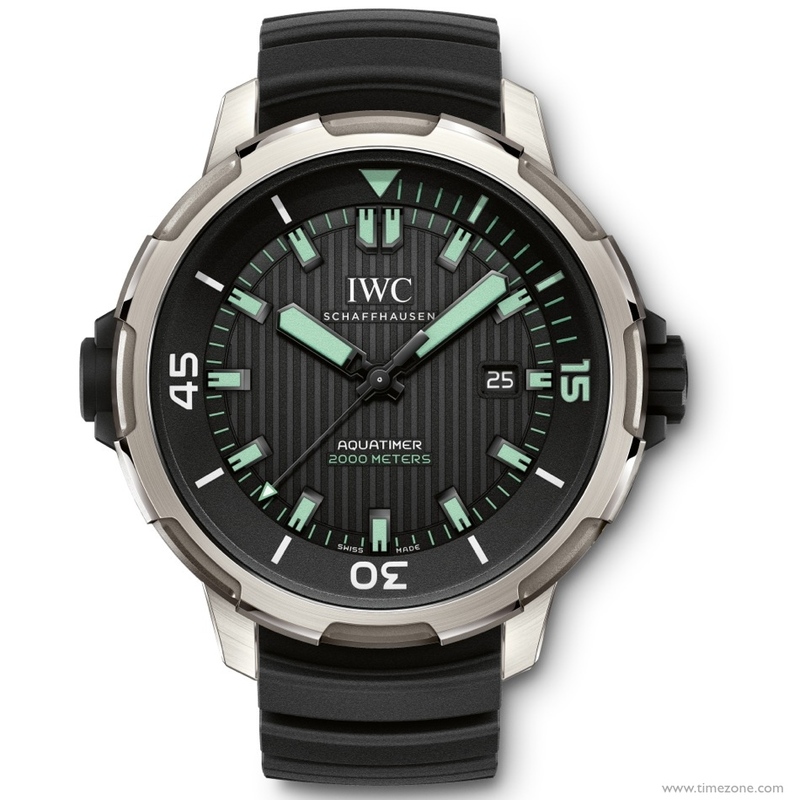 The Aquatimer Automatic 2000 features the rugged IWC-manufactured 80110 calibre with Pellaton winding system. 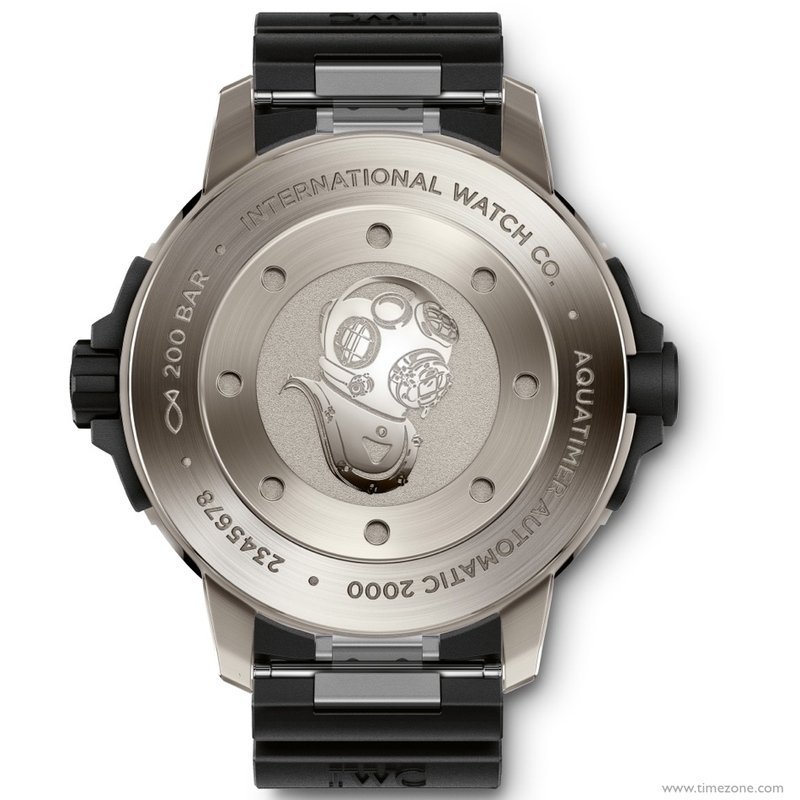 The Aquatimer Chronograph Edition "50 Years Science for Galapagos" (Ref. IW379504), limited to 500 watches, IWC honours the 50th anniversary of the Charles Darwin Research Station, a scientific institution set up by the Charles Darwin Foundation. The Aquatimer Chronograph Edition "Galapagos Islands" (Ref. IW379502), which comes with identical technology, has been an expression of IWC's commitment to the threatened archipelago. 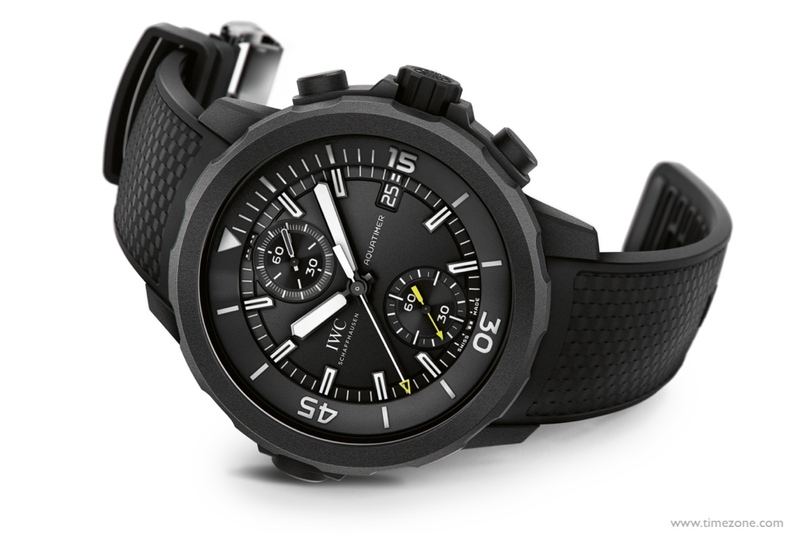 Both watches are powered by an IWC-manufactured 89365 calibre and have an attractive black rubber coating. 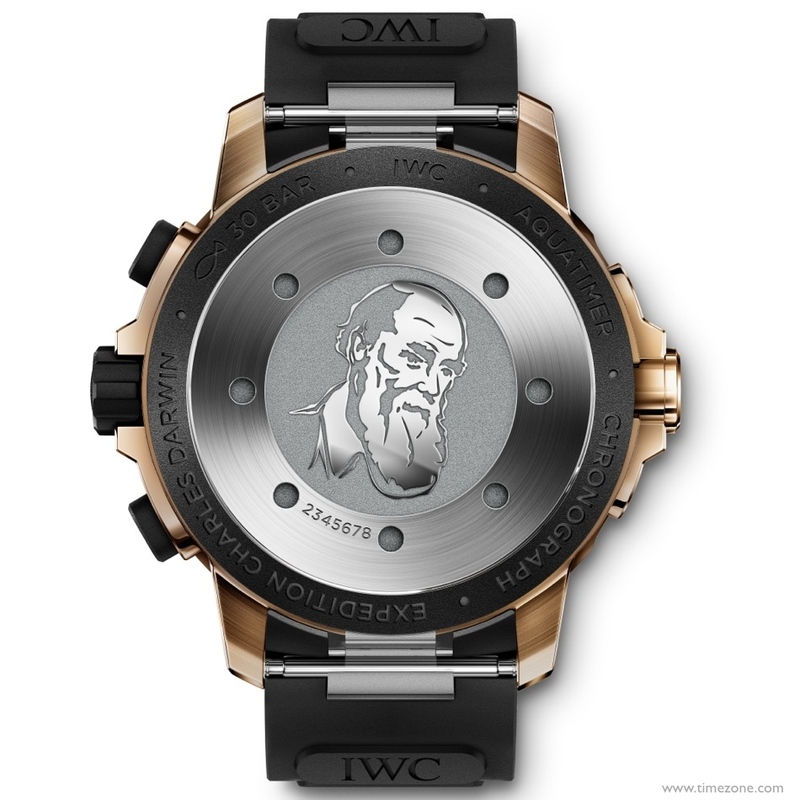 With the Aquatimer Chronograph Edition "Expedition Charles Darwin" (Ref. 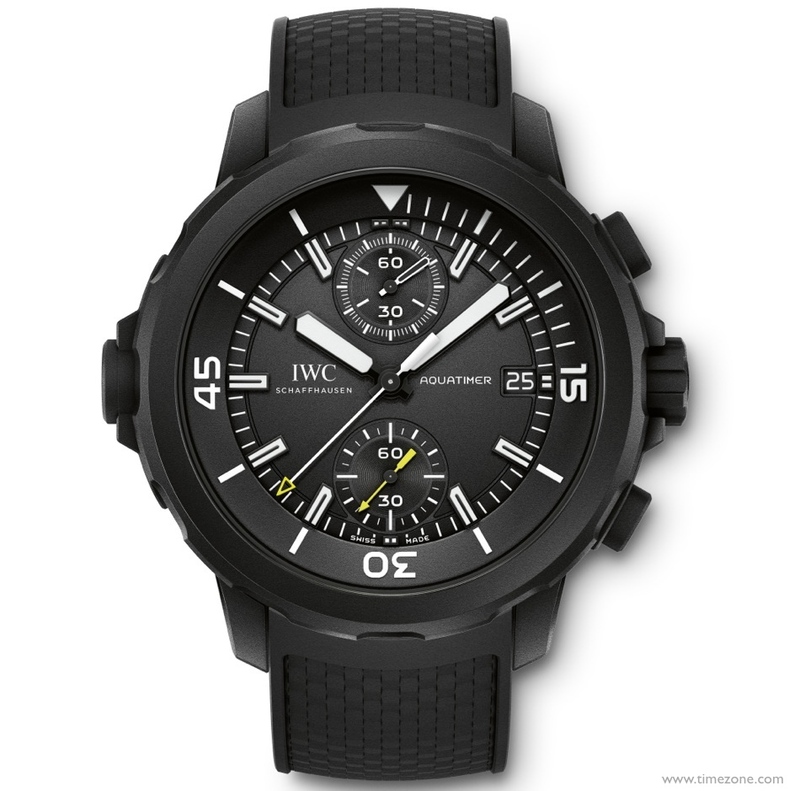 IW379503), IWC Schaffhausen traces the journey of the well-known naturalist to the Galapagos Islands. Here, Darwin collected the evidence that formed the basis of his theory on the origin of species. As a tribute to this event, and for the first time ever, IWC Schaffhausen makes use of bronze for a watch case: the metal alloy was one of the materials typically used in shipbuilding at that time. 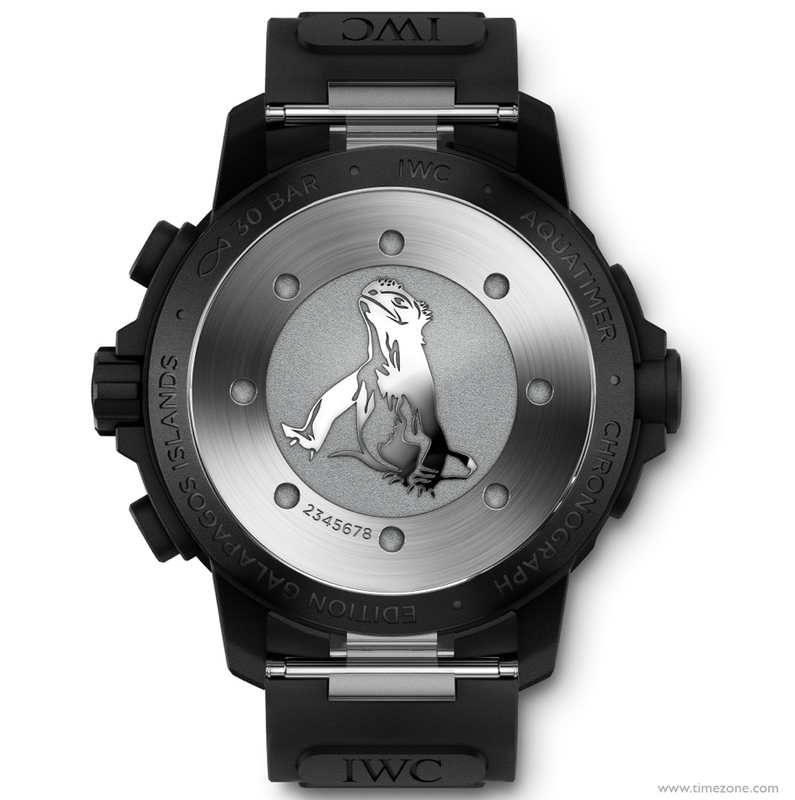 This special edition is also equipped with the IWC-manufactured 89365 calibre. Previous Topic: Smaller/half-links for Ingenieur 3239 bracelet? Next Topic: What is the best aftermarket big pilot 5004 strap?